Bushnell has been a leader in the Golf tech industry for years. Time and time again, they’ve given golfers the accurate distances they need. Joining the Bushnell inventory in 2018 is the ION2, an upgrade on the now discontinued NEO ION. It’s not just any golf GPS device, it’s golf tech you can wear. The rangefinder watch runs off satellite technology. You won’t have to plug in any course or hole information since the Ion 2 will know exactly where you are. As you move from hole to hole, it will automatically display that hole’s stats. What are those stats? The 23 x 23 mm display screen will feature distances to the front, center, and back. It’ll also provide you with distances to up to four hazards. Keep your knickerbockers dry and avoid pond scum! But, is the Ion 2 comfortable to wear? The slotted, reversible silicone bands are breathable and allows for comfort even when you’re sweating bullets. You don’t have to pull out and stow away bulky GPS units anymore, all you have to do is wear it. As is standard for state-of-the-art tech, the Ion is pre-loaded with over 36,000 courses worldwide. 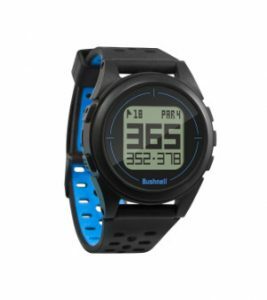 When you buy the golf watch, you’ll also have Bluetooth access to the Bushnell Golf app where you can wirelessly download course updates. If you want to see a detailed layout of the course through the app, you can have a bird’s eye view of it, 3D flyovers, and hole layouts with distances. If you’re counting calories, the Bushnell watch can count your steps for you. It has a round odometer and shot distance calculator. But, what if you forget to take the watch off? No problem. The Ion 2 functions like an everyday watch providing time, date, and day info. With a USB charging cable, you can plug in literally anywhere these days. Give it some juice in the car on your way to the course or plug it in to your laptop while you’re at work. With the Ion, you can keep your “eye on” the pin. What a fitting name, don’t you reckon? How long does the Ion 2 Battery Last? In Golf Mode, the Ion 2 will last approximately 12 hours. Depending on speed of play, you may get up to three rounds with the golf watch. How long does the Bushnell battery take to charge? Full charging time is estimated to be less three hours. Is the Ion 2 Charger included? A USB cable charger is included with the Ion 2 golf watch purchase. Some users say the charger is very fragile, and there may be issues with the charging port. Bushnell recognizes this as a defect, and if you have this issue, they recommend contacting them for exchange and/or repair. The USB cable needs to be plugged into a USB port. The charging port is on the back of the watch and it clips in place. Contact pins need to be lined up correctly for the battery indicator to show up on the face of the watch. Why does the Golf Watch Lose the Course mid-play? The first answer that comes to mind is satellite connectivity loss. This can happen, and it might also have to do with the weather. However, some users report this as an on-going issue. The watch may be defective and can be qualifiable for exchange. 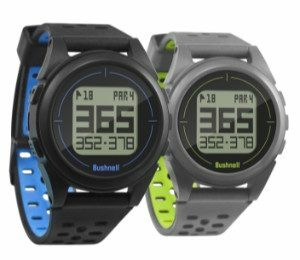 What does the Bushnell Watch do when it loses the Course/hole? When the watch loses satellite connectivity and comes out of Golf Mode, it will default to the time. You will have to sync again to connect to the course and hole you’re on. Does the Ion 2 have color options? There are two color options available: black with blue detailing and grey with neon green detailing. Can the Watch band be Replaced? 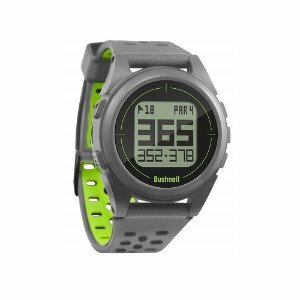 Yes, you can replace the watchband on the Bushnell Ion 2 golf watch. 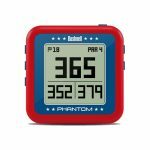 Differences between ION 2 and Older Bushnell Golf Watch Models? The Ion 2 now offers Bluetooth connectivity, so you can now download course updates without plugging it in to a computer. It also comes with access to the Bushnell Golf app (a feature that was not included in the old NEO ION watch) that can be downloaded to your smartphone, so you can get detailed info about the course. To ping up the strokes, the Bushnell Ion 2 golf watch is a smart gadget to have on the green. 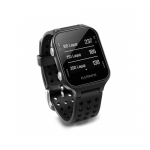 With distances available at the turn of the wrist, it’s more convenient than ever. With the Bushnell Golf app available with just a few finger strokes, you can get 3D flyovers and hole layouts for a full view of what’s ahead. But, if you’re not the watch-wearing type of golfer, then check out the budget-friendly Bushnell Phantom. It has a bite magnet mount that allows it to be attached to any metal surface. A belt clip is included, and it’s easier than ever to put on and take off. It’s simple and easy to use, and it’s tournament legal, too. But, sometimes it’s easier to just be told the distance. Without having to look at your device each and every time you move from hole to hole, the Golf Buddy Voice 2 will read aloud the distances to the front, center, and back of the green. It also has two hours more of play time than the Ion 2. Worth checking out? Oh yeah! It’s not the fanciest golf gadget out, so it’s not the most complicated and time-consuming golf watch around, and we think that’s a good thing. When you have the distance, you can make well-informed decisions to break 80. With the Ion 2, you can keep your “eye on” the ball!